Do not cut back your native perennials or grasses this fall. They not only provide food for wildlife but shelter in fall and winter. For example, many butterflies, toads, fireflies and other insects overwinter in leaf litter and organic matter. Birds, wild rabbits and other wildlife use leaves, seed heads, twigs and branches for food, nesting material and shelter from the cold. Some native bees overwinter in hollow plant stems. Plus your garden is so much more interesting when plants are covered with snow or frost, or are rustling in the wind. To learn more, please read: Put down those Pruners! Collect some native seed from your garden to share with others or spread in other parts of your landscape. Here are some basic seed collecting tips . Sow perennial seeds directly into your prepared garden bed. You can even sow seed when there’s snow on the ground. Cut off the seeds heads of more aggressive native plants to prevent them from re-seeding into the garden. Some gardeners do this with native Cup Plant, Indian Grass, Goldenrods, and False Sunflower. Leave the seed heads in a tray for wildlife to enjoy. Fall is a good time to smother lawn to create new garden beds. Continue to water your plants during droughts, especially trees and shrubs, if the soil is not frozen. Wild rabbits often eat small trees and shrubs during winter when there’s little else to eat. Rabbit proof young trees and shrubs with 2-3′ high chicken wire. Secure wire with U-shaped garden pins along the bottom. A separate brush pile and water source can help rabbits survive the winter. Check the Internet for more suggestions. If you want to plant perennials in early fall, remove or prune off all the flowers and seed heads. This will help the plant focus it’s remaining energy on making roots. Watch for frost heaving. If you can’t plant all your perennials before early October, you can overwinter them in a protected spot and mound leaves around the plants when the weather is consistently cold. And even though I may sound like a broken record, Please read my article about what to do with your leaves: Leave the Leaves, as well as brush and rock piles, and snags (dead trees). All are important for the survival of wildlife over winter. Document what did well this year, what you want to do next year, and what you have learned. You’ll begin to see some patterns as well as some fascinating surprises from nature. Empty your rain barrel and disconnect. Cover the top, tied down to prevent barrel from falling over on a windy day, and leave the rain barrel spigot open if stored outside. Clean and sharpen your tools and winterize other yard equipment. Fall is a good time to maintain your birdfeeder, birdhouses, and bird baths to prevent the spread of diseases and make repairs. Connect your electric birdbath if you have one, following all safety instructions. Here is a Facebook post sharing tips on how I clean my birdbath during winter. Turn over or put away flower pots, rain barrels, bird baths or anything else that may collect water, freeze and crack over winter. Shut off your outside water if you have a shut-off valve. Collect leaves, seed heads, branches, flowers and dried fruits or nuts for craft projects. Northern Sea Oats, Hydrangea flowers, Oak leaves (press first), acorns, Buttonbush, Coneflowers, Red twig dogwood, Milkweed pods and Compass Plant leaves (press first) are just a few suggestions . Be creative! 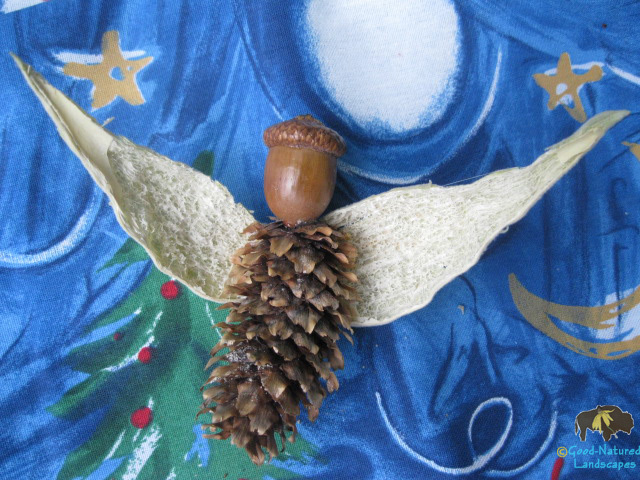 For example, milkweed pods make cute angel wings glued to a pine cone angel body (see photo above). 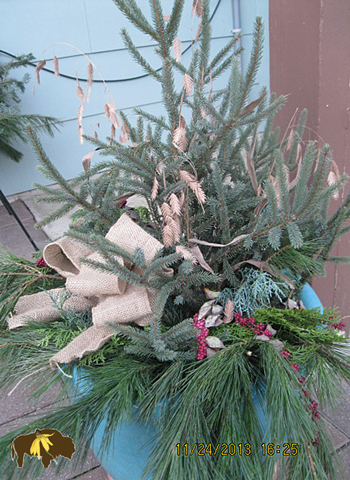 Native Northern Sea Oats, Coralberry, Eastern Red Cedar mixed with other evergreens and a burlap bow, make a very nice natural arrangement that will last many months outdoors. Hope for a nice blanket of snow this winter. Snow not only adds moisture to the ground but provides a layer of insulation which reduces frost heaving of plants installed in fall while protecting plant roots. Contact Good-Natured Landscapes for an earth-friendly, custom landscape plan so you will be ready to install next spring! We can still design your landscape in between snow cover. Please share any of your suggestions or tips below. Thank you! Thanks Leslie. Forgot one important thing – we all need to turn shut off our outside water using the shut-off valve located inside your house, usually in a basement or crawl space. I like to remove my hoses, store them, and drain any water in the line by turning on the outside spigot for a day or two to give all water a chance to evaporate, then I close it again so no cold air enters the water pipe from the outside. See the Internet for more info. Thanks for providing the multiple tips regarding maintenance of fall garden, I will surely be following them in my garden to enhance the outdoor living of my house.